If there's one thing that's set to be huge this S/S, it's denim. Denim skirts, denim shirts, denim jeans... denim erry'thing. With the 70s revival that's currently taking over the trend books, combined with the recent 90s boom, the next season sees the emergence of some new styles that will quickly filter into most high street stores. I've selected only bottoms here, but there's also a fab, long, black denim shirt on Topshop's website (see here) and some super cute denim skirts (think Alexa Chung x AG) that seem to be taking over the blogosphere right now. 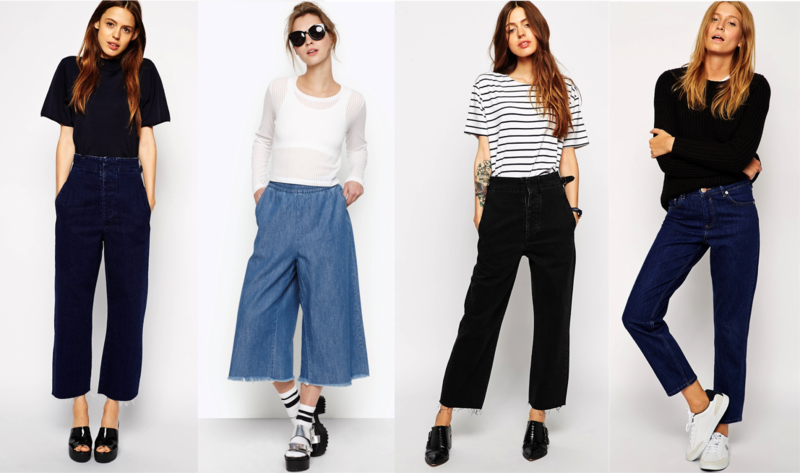 After seeing them on Hannah's blog, I'm totally obsessed with the highwaisted, wide-leg jeans (images one and three). I'm not entirely convinced they will suit my short legs, but I might just have to order them and see. I like the indigo but the black might just be a bit more flattering, especially for us petite girls! The 'girlfriend' jean is also an emerging style, a slightly slimmer, more flattering version of their 'boyfriend' counterparts. I love the idea of this relaxed fit with some white kicks and a loose fitting tee. Which new style is your favourite?